Published February 20, 2013 By Anna T. This post may contain affiliate links. Regardless, I only recommend sites I've researched and/or used and trust. Good work from home job leads are really not that hard to find if you know where to look and, in the case of Craigslist, what to look for. There are lots of bloggers and webmasters, including myself, who spend hours per day hunting up good work at home leads to share. Today I'm showing you how to get job leads from the best work at home resources on the web. Some of these you may already be aware of, but hopefully some will be new to you. This site isn't free to access, but the $14.95 per month you pay is a very good value when you consider the quality of the leads they share. FlexJobs has a lot of happy customers and are often recognized by larger media and news outlets as the “go-to” resource for home-based jobs. They hand-pick all their leads and carefully screen each one so you can be sure they are scam-free. I have signed up for their service in the past to check it out and was impressed with the home-based job listings I found. I am still a subscriber today. FlexJobs also has some employers who share their leads exclusively through the FlexJobs site, although many of the leads you could find posted elsewhere if you took the time to look. If you're a freelance writer, you'll greatly benefit from the writing listings at Contena. I have no idea how their team finds so many good, well-paying leads, but they do. It's not a free job board, but they do often have discounts available. You can go here to check it out, or here to read our review of Contena. If you decide to sign up, use coupon code “ways2earn” at checkout to get 10% off your membership. Lisa at Work at Home Mom Revolution keeps her site updated with great new work at home job leads. She adds things almost every day and takes it farther than just listing the lead. She also provides a ton of helpful information about each job posting including how much they pay, where you have to be located if location is a factor, and the skills and experience required to land each job. In addition to Lisa's near-daily detailed job postings, she also has a job board she updates about three times per week with other leads she finds. Work at Home Adventures has a regularly updated job board built into their website that receives updates a few times a week. This is an old, reputable site with tons of great blog post articles on working from home as well. Rat Race Rebellion posts new jobs work at home job leads six days a week. Their leads are carefully screened before being posted and there are usually at least 10 or more jobs posted every day. They also have a newsletter that you can subscribe to with even more leads. 1099 Mom does a weekly “Picks & Promos” post with lots of great new work at home job listings. I also recommend exploring the rest of her site, particularly her “I Want to Be …” posts that highlight specific home-based professions, straight from people who are already involved. 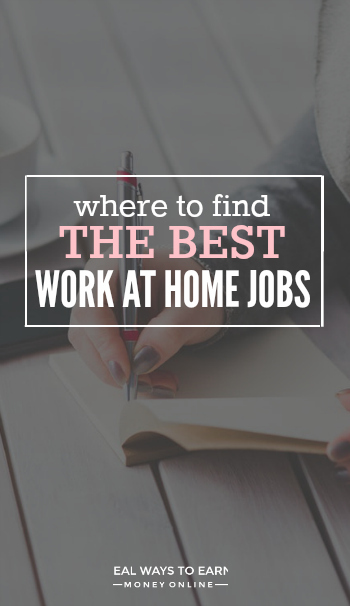 This is an excellent blog with a great list of work from home jobs here. Be sure to explore the rest of the site while you are there. This site has been in existence for over seven years, and there is a ton of great content in the form of blog posts to help you better educate yourself on work at home jobs, extra money ideas, and home business opportunities. Angie at The Work at Home Wife shares job leads weekly on her blog here. She also has some good extra cash recommendations and takes time to include how much she has earned from each program. This is a big site with lots of good work at home information. If you want to know how to get job leads from here, simply browse the “Weekly Jobs” section. I've found a lot of interesting little gems in there that aren't posted elsewhere. ProBlogger Job Board – This is one of the best places to keep up with for good writing leads. Writers Job Board – Another great board for writing jobs. Freelance Writing Gigs – Another good one if you're looking for writing leads. Adhuntr – I love this site because it searches all of Craigslist. Use (in quotations) “telecommuting” or “work from home” as your search terms to find the home-based leads. There are lots of scammy things posted on Craigslist, so be careful. I tend to stick with listings that have a company name mentioned and are very specific in what they're looking for. Steer clear of vague, too good to be true listings with no company name mentioned. I also consider it a red flag if the listing has a lot of poor spelling & grammar. Indeed – I find all kinds of awesome things listed at Indeed. It's usually my first go-to when I begin searching for home jobs. Please note that that just like Craigslist, these jobs are not all screened so do your due diligence. Work At Home Arena – They have a special sub-forum for new job leads. I'm always finding awesome things there thanks to the helpful members who take the time to research and share their findings. WAHM (forum) – The Telecommuting Moms forum usually has a few good leads listed. The site also has a job board, too. I continue to stress how important it is to do your own research, but that may be easier said than done if you've never actually researched work at home before. The articles listed below should help. You can apply the rules listed to researching any work at home job regardless of where you find it. I'd love to know how you get work at home job leads! Please comment below and share your resources. I also go on a website called Workathomenoscams.com, which is run by Eddy Salomon. He also also posts different work at home positions and researches jobs to make sure that they are not scams. He suggests you do research also to insure the jobs are legit. Eddy has a great website! Thank you for sharing! I’ve always been interested in working at home but the number scam sites out there just made me skeptical. The information you provided has been very helpful, thanks. Are there any work at home jobs open to mom’s living in Africa? Nigeria to be precise. You’re welcome! I don’t know about Nigeria specifically, but I have reviewed a lot of companies in the past that are open worldwide. You can see those here – http://realwaystoearnmoneyonline.com/category/worldwide-opportunities/ Some of those may be options for you. Thank you for giving such a great source of information. I’ve been looking for a job from home but there are many scams. Thank you again for your hard work. This is one of the best sites I have come across in quite sometime and I am on the web everyday!!! I found it on Pinterest! Thanks for sharing this great and very helpful information. Thank you, Lori! Much appreciated! I come here! Your site is one of my favorite out of four. I found you a while back through wahm.com’s forum, I bookmarked you and have come back ever since. Glad to see there are other sites to check out, as well. You have an awesome and extremely helpful/useful blog. Great job on all your hard work! Thanks, this is very helpful and I’m sending others your blog’s link. Anna – what an excellent article chock full of great resources. I absolutely adore your site. Your hard work and dedication are apparent in the quality of your blog. Thanks for helping us navigate through the sea of work-at-home opportunities! Thank you! This is great information! Thanks so much for including me in this amazing list! I consider some of these sites the inspiration for us getting started years ago. I’m honored and inspired! Thank you so much Anna! You are a very giving person and it will all come back to you. You are a very creative and talented blogger. You deserve a lot of respect for sharing the light with your fellow work at home bloggers. Your list is very impressive! Great list!! Thanks for including me. Thanks for the recommendation, Anna! I really appreciate it! You have a great list here. This is a great list! Alicia who runs workersonboard also has a youtube channel called super2moms, she’s awesome. Thanks for all you do.